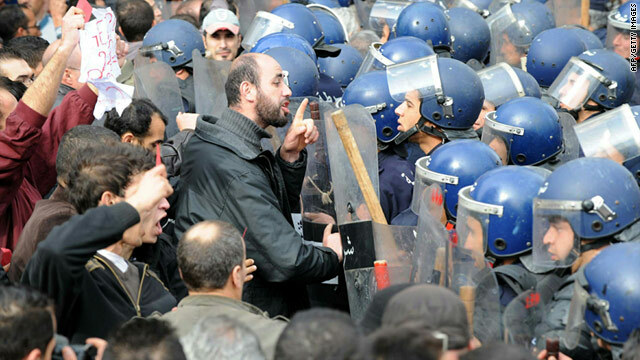 A man gesture towards Algerian police surrounding demonstrators Saturday in Algiers. Algiers, Algeria (CNN) -- An Algerian activist said police and thugs attacked protesters in the nation's capital during anti-government demonstrations on Saturday, wounding dozens in the crowd. Khalil Abdul Moumin, the general-secretary of the Algerian League for Human Rights, said protesters congregating at the May 1 Square in Algiers, which commemorates international labor day. They "were faced with thousands of police officers" as they prepared to march toward Martyrs Square, which memoralizes the people who died in Algeria's war of independence last century. "They attacked us and used gangs of thugs to start a fight with us," Moumin told CNN, noting that dozens of protesters were injured, including a parliament member and a union leader. "I was attacked myself by the thugs who tried to stab me, I was rescued by the protesters in the last minute," he said. "All of this happened in front of the police and they did nothing to stop it." News footage showed pro- and anti-government protesters scuffling as helicopters circled overhead. Journalist Said Chitour said he didn't see police attack anti-government protesters during the demonstration, which spanned over more than four hours. However, he saw thugs insult and push protesters, and throw bottles, cups and sharp tools at them. They sang pro-government songs as police separate the opposing protesters. Anti-government protesters chanted "The people demand the fall of the regime" and, Chitour said, police cleared streets during the demonstration to make way for traffic. Discontent in the North African country has been brewing over high food prices, high prices of unemployment and housing issues, and many people have called for government reform. Demonstrations began in Algiers last month and spread to other cities as demonstrators toppled regimes in neighboring Tunisia, and later in Egypt. Algerian President Abdelaziz Bouteflika has announced that he will lift the state of emergency in what analysts said was an attempt to head off a similar revolt. The emergency was imposed in 1992 to quell a civil war that led to the deaths of more than 150,000. While the rule was used to clamp down on Islamist groups, critics say the insurgency has long since diminished and the law exists only to muzzle government critics. The United States and Algeria have grown closer since the September 11, 2001 terrorist attacks, with the North African country aiding in counter-terrorism and law enforcement. Both countries work closely on Middle East issues, and cooperation by both countries' militaries has grown.